It was way back in 2010 that the then-CEO of Google got on stage and urged application developers to adopt the policy of mobile first. He had good reason to do so. Since then, the power and importance of the Smartphone has only increased, with a recent study suggesting that by the end of 2014, there will be 1.75 billion Smartphones in the world. Naturally if you want to build an online store or a digital extension of your brick-and-mortar business, you would want to make it mobile-enabled in order to reach out to the largest possible audience. Easy to use website builders like Easysite help you create not just a powerful and feature-rich desktop website, but also a mobile version of the same. Creating a mobile website is different from building a desktop website, because user behavior is very different on these two platforms. Thus, when you are creating a mobile website, it’s very important to remember a few rules of good mobile website design. While powerful site builders like Easysite will provide you with all the tools necessary to build an attractive and secure website, here are some tips to help you make the most of those tools and create a mobile website that your audience would want to keep coming back to. Responsive Design: Mobile devices come with a dizzying array of screen sizes and aspect ratios – far more than desktop monitors. Thus, it has become absolutely crucial that your website design be responsive. To put it simply, a responsive website is one that automatically adjusts to the size of the screen it is being displayed on, with images and text content realigning themselves so that the design of the website remains consistent and the user does not have to scroll or zoom excessively. One great advantage of a responsive website is that it can be deployed on desktops as well as mobile devices – a veritable one-size-fits-all solution. All websites made using powerful website builders like Easysite are responsive, so you don’t have to worry with third party tools to incorporate this feature. Or start creating a mobile website. Streamlined Content: While Smartphones can be just as, if not more powerful as desktop devices, mobile Internet connections usually are usually more expensive. Thus it is best to limit the number of images and the amount of content on your website so that your user doesn’t incur excessive data charges while browsing it. Remember, streamlined content does not necessarily mean poor quality content. In fact, focused, tight and to-the-point content is often more attractive and has a greater chance to convert than pages of text and pointless images. 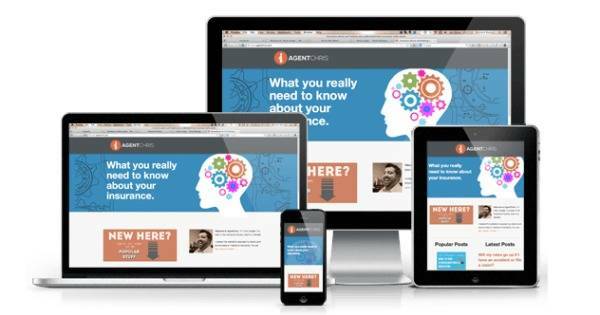 Tools like Easysite allow you to easily make changes on your website after you have built it, so you can create a website, test it out on a variety of mobile devices, connections and browsers, and alter your content based on the end-user experience as and when you see fit. Social Integration: A significant number of users access their social media profiles not through their desktops, but through their Smartphones while on their way to work, waiting for the bus or when in line for movie tickets. Thus, if you want people to talk about your website and products on their social media profiles, or to like and follow your official social media channels, then you have to enable one-click social media integration on your mobile website. Add social media icons on every page and make sure they are prominent and easy to access. Feature-rich website creation tools like Easysite offer a number of options when it comes to social media integration, making this task quite easy and allowing you to provide an added benefit to your users. Unified Branding: It is very important that your mobile website feel like an extension of your traditional marketing and branding activities. Thus, you need your mobile website to share branding with your offline presence, and the only way to do that is to incorporate your logo, company colours and other identifiable design elements into your mobile website. This can be easily accomplished with the help of user-friendly website builders like Easysite, that give you the option of adding your own background images and wallpapers into the site that you have built, thereby allowing you to add your custom design elements throughout your new mobile website. The era of the mobile is well and truly here, and every year, it becomes more and more important to have a presence on the mobile web. Even if you already have a desktop website, it is not an ideal solution for mobile users as the desktop landscape format does not display well on a portrait-oriented mobile screen. Thus, you have to take your desktop website to the mobile web, or create one that serves the purpose of both. With Easysite, this transition is easy and hassle free, and you do not have to spend through your nose for custom mobile website development either, its included. Easysite – Using Easysite you don’t have to start creating a mobile website as the website you build will automatically be a responsive website design and look great on any device its viewed on. You can even try create a website free for 30 days. This makes Easysite one of the best online site builders for your business.